The glittering silver cross design on the front of these candle holders makes them perfect for weddings, baptisms or communions. No matter what the occasion, they will look great and be well-received by guests. 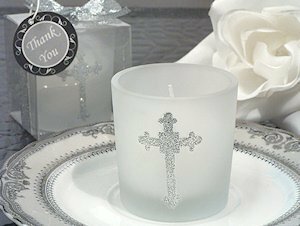 Candles stand about 2" tall and arrive individually boxed in a clear gift box that is tied with a silver ribbon and matching "Thank You" tag making them ready to give to your guests. Votive candle included.